This article is about the mythological figure. For the moon of Pluto, see Charon (moon). For other uses, see Charon (disambiguation). In Greek mythology, Charon or Kharon (/ˈkɛərɒn, -ən/; Greek Χάρων) is the ferryman of Hades who carries souls of the newly deceased across the rivers Styx and Acheron that divided the world of the living from the world of the dead. A coin to pay Charon for passage, usually an obolus or danake, was sometimes placed in or on the mouth of a dead person. Some authors say that those who could not pay the fee, or those whose bodies were left unburied, had to wander the shores for one hundred years. In the catabasis mytheme, heroes – such as Aeneas, Dionysus, Heracles, Hermes, Odysseus, Orpheus, Pirithous, Psyche, Theseus and Sisyphus – journey to the underworld and return, still alive, conveyed by the boat of Charon. Charon is the son of Erebus. He was also the brother of, among many others, Thanatos and Hypnos. The name Charon is most often explained as a proper noun from χάρων (charon), a poetic form of χαρωπός (charopós), "of keen gaze", referring either to fierce, flashing, or feverish eyes, or to eyes of a bluish-gray color. The word may be a euphemism for death. Flashing eyes may indicate the anger or irascibility of Charon as he is often characterized in literature, but the etymology is not certain. The ancient historian Diodorus Siculus thought that the ferryman and his name had been imported from Egypt. Charon is depicted frequently in the art of ancient Greece. Attic funerary vases of the 5th and 4th centuries BC are often decorated with scenes of the dead boarding Charon's boat. 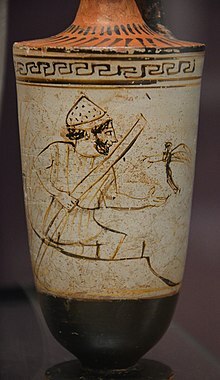 On the earlier such vases, he looks like a rough, unkempt Athenian seaman dressed in reddish-brown, holding his ferryman's pole in his right hand and using his left hand to receive the deceased. Hermes sometimes stands by in his role as psychopomp. On later vases, Charon is given a more "kindly and refined" demeanor. A girdle, foul with grease, binds his obscene attire. Other Latin authors also describe Charon, among them Seneca in his tragedy Hercules Furens, where Charon is described in verses 762–777 as an old man clad in foul garb, with haggard cheeks and an unkempt beard, a fierce ferryman who guides his craft with a long pole. When the boatman tells Heracles to halt, the Greek hero uses his strength to gain passage, overpowering Charon with the boatman's own pole. In the second century, Lucian employed Charon as a figure in his Dialogues of the Dead, most notably in Parts 4 and 10 ("Hermes and Charon" and "Charon and Hermes"). In the Divine Comedy, Charon forces reluctant sinners onto his boat by beating them with his oar. (Gustave Doré, 1857). In the 14th century, Dante Alighieri described Charon in his Divine Comedy, drawing from Virgil's depiction in Aeneid 6. Charon is the first named mythological character Dante meets in the underworld, in Canto III of the Inferno. Dante depicts him as having eyes of fire. Elsewhere, Charon appears as a mean-spirited and gaunt old man or as a winged demon wielding a double hammer, although Michelangelo's interpretation, influenced by Dante's depiction in the Inferno, shows him with an oar over his shoulder, ready to beat those who delay (“batte col remo qualunque s'adagia”, Inferno 3, verse 111). In modern times, he is commonly depicted as a living skeleton in a cowl, much like the Grim Reaper. The French artist, Gustave Dore, depicted Charon in two of his illustrations for Dante's Divine Comedy. The Flemish painter, Joachim Patinir, depicted Charon in his Crossing the River Styx. And the Spanish painter, Jose Benlliure y Gil, portrayed Charon in his La Barca de Caronte. Most accounts, including Pausanias (10.28) and later Dante's Inferno (3.78), associate Charon with the swamps of the river Acheron. Ancient Greek literary sources – such as Pindar, Aeschylus, Euripides, Plato, and Callimachus – also place Charon on the Acheron. Roman poets, including Propertius, Ovid, and Statius, name the river as the Styx, perhaps following the geography of Virgil's underworld in the Aeneid, where Charon is associated with both rivers. Charon, the largest moon of the dwarf planet Pluto, is named after him. The hadrosaurid Charonosaurus is named in Charon's honor because it was found along the banks of the Amur River in the Far East. "Haros" is the modern Greek equivalent of Charon, and usage includes the curse "you will be eaten (i.e., taken) by Haros", or "I was in the teeth of Haros" (i.e., "I was near death/very sick/badly injured"). During the Korean War, the Greek Expeditionary Force defended an outpost called Outpost Harry. The Greek soldiers referred to it as "Outpost Haros". ^ Not on the eyes; all literary sources specify the mouth. Callimachus, Hecale fragment 278 in R. Pfeiffer's text Callimachus (Oxford UP, 1949), vol.2, p. 262; now ordered as fragment 99 by A.S.D. Hollis, in his edition, Callimachus: Hecale (Clarendon Press, Oxford 1990), pp. 284f., from the Suidas, English translation online, specifying the mouth, also Etymologicum Graecum ("Danakes"). See also Smith's Dictionary of Greek and Roman Biography and Mythology, entry on "Charon" online for placement in the mouth, though archaeology disproves Smith's statement that every corpse was given a coin; see article on Charon's obol. ^ Liddell and Scott, A Greek-English Lexicon (Oxford: Clarendon Press 1843, 1985 printing), entries on χαροπός and χάρων, pp. 1980–1981; Brill’s New Pauly (Leiden and Boston 2003), vol. 3, entry on “Charon,” pp. 202–203. ^ Christiane Sourvinou-Inwood, "Reading" Greek Death (Oxford University Press, 1996), p. 359 online and p. 390 online. ^ Grinsell, L. V. (1957). "The Ferryman and His Fee: A Study in Ethnology, Archaeology, and Tradition". Folklore. 68 (1): 257–269 [p. 261]. doi:10.1080/0015587x.1957.9717576. JSTOR 1258157. ^ Virgil, Aeneid 6.298–301, as translated by John Dryden. ^ See Ronnie H. Terpening, Charon and the Crossing: Ancient, Medieval, and Renaissance Transformations of a Myth (Lewisburg: Bucknell University Press, 1985 and London and Toronto: Associated University Presses, 1985), pp. 97–98. ^ For an analysis of Dante's depiction of Charon and other appearances in literature from antiquity through the 17th century in Italy, see Terpening, Charon and the Crossing. ^ See Kharon at theoi.com for collected source passages with work and line annotations, as well as images from vase paintings. ^ Dennis, Overbye (2013-07-02). "Two of Pluto's Moons Get Names From Greek Mythology's Underworld". The New. The New York Times. Retrieved 15 July 2015. ^ Godefroit, Pascal; Shuqin Zan; Liyong Jin (2000). "Charonosaurus jiayinensis n. g., n. sp., a lambeosaurine dinosaur from the Late Maastrichtian of northeastern China". Comptes Rendus de l'Académie des Sciences, Série IIA. 330: 875–882. Bibcode:2000CRASE.330..875G. doi:10.1016/S1251-8050(00)00214-7. ^ "The soldiers of the Greek Expeditionary Forces called it Outpost "Haros" the Greek name for Death. It was classic wartime humor, a dark pun borne of a hopeless mission". outpostharry.org. Smith, William; Dictionary of Greek and Roman Biography and Mythology, London (1873). "Charon"